Today we are going to share with you, two fun ways to get your kids to eat more fruit. My grand kids love fruit so I didn’t have to coax them too much! 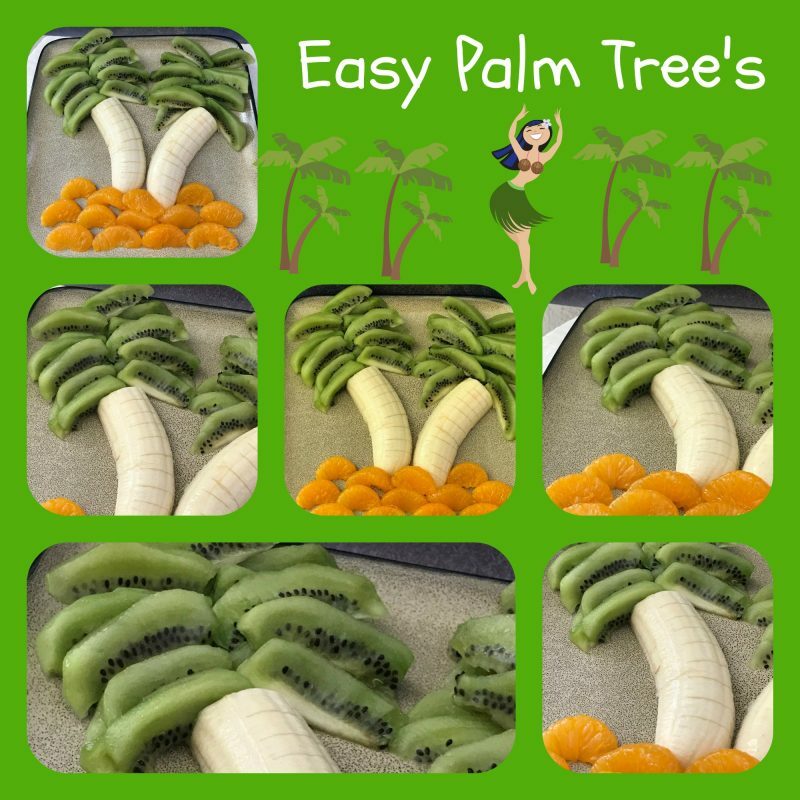 They were more than pleased when I asked them to help me make these “banana palm trees” and “banana flowers.” All that you need to make both of these fun ways with fruit is: banana’s, strawberries, kiwi, and mandarin oranges. This is one of those “recipes” where you really don’t need a recipe. In fact, I saw both of these idea’s on Pinterest and thought that these would be a fun addition to our “Play With Your Food” A Series For Kids” that we are featuring throughout the summer. In under 5 minutes you can make these fun fruit ideas. Just sit back and watch your kiddos devour their banana palm trees and banana flowers. A recipe really isn’t necessary when making either of these fun treats. To make the palm trees, simply peel you bananas, slice them in half lengthwise and place them on a plate. Peel a couple of kiwi and slice. Cut eat slice of kiwi in half and place the kiwi around the top of the banana to form palm leaves. Make slices into the banana, but don’t slice all the way through. Place mandarin orange slices around the bottom of the banana. To make banana flowers is so easy. Peel a banana, slice in half lengthwise. Slice each banana half in half again lengthwise. Place banana on a plate for flower stems. 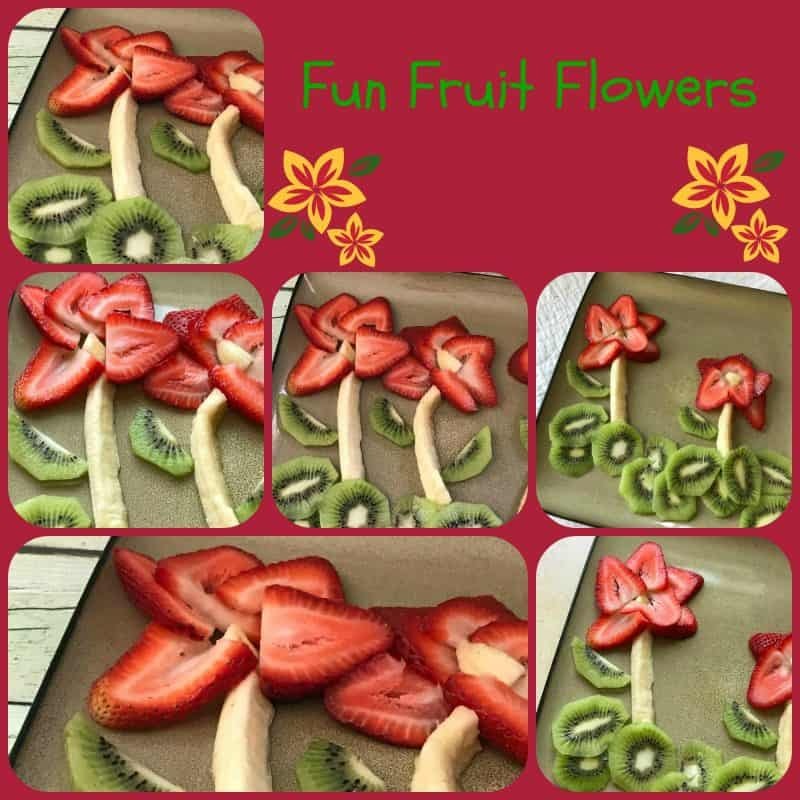 Slice a strawberry and place at the top of the banana stem in a circular pattern to make flower petals. Place a small piece of banana in the middle of the strawberry flower. Peel a kiwi and slice. Use the kiwi slices for petals and place at the base of the banana. Have a sweet tooth? Give these a try. Chocolate Crinkle Blossoms, and Plum Kuchen Coffee Cake.